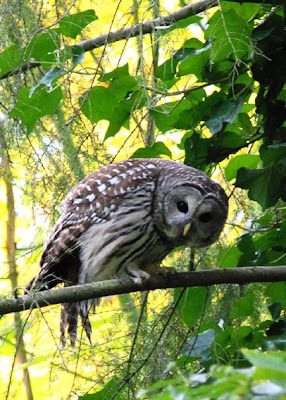 MudBay Musings: Whooo's Watching Whooo? 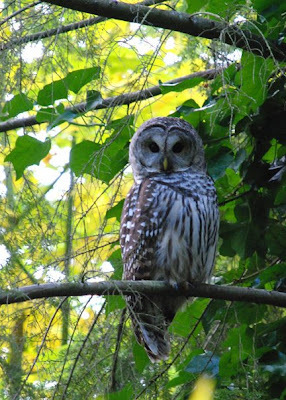 An unexpected sighting of a Barred Owl caused quite a stir at our household. It was quite inquisitive and seemed amused rather at my frantic photo-taking. I lingered for quite some time observing this beautiful creature, and couldn’t help but wonder - who was watching who? Great pictures! What a gorgeous creature! Thank you for sharing your pretty photos. Owls are the such beautiful and sweet looking creatures. You are a lucky person indeed! You are such a warm and generous person! Thank you for sharing your perspective with us all. I knew we share a love for vintage millinery flowers, but now I see we share far more than that! Cathy, this is a gorgeous owl! How fortunate you were to be able to capture it for all of us to see. Oh I love these pictures! Owls are my very favorite!